Junior Ryan Wolfshorndl is one of 10 students nationwide to receive a prestigious business scholarship from Liberty Mutual. While the cost of college tuition has climbed in recent years, so has the amount of money available for scholarships. Students compete for these awards as fiercely as they contend for admission to elite institutions. More than 80 percent of Westmont students rely on some sort of financial aid, but few have received more scholarship money than Ryan Wolfshorndl ’05. The junior economics and business major has funded his education with more than $65,000 in grants. This assistance has come from the Bank of America, AAL, the Lutheran Brotherhood, the California-Hawaii Elks Association, the Fellowship of Christian Athletes, the Governor’s Scholarship, Pioneer, a Robert C. Byrd Scholarship, a Westmont Presidential Scholarship, a CSF Sealbearer award and the local Soroptomist club. His most recent recognition is also one of the most prestigious. 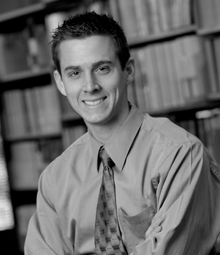 Ryan was selected as one of 10 Liberty Mutual Scholars nationwide for the 2003-2004 academic year. The award carries a $5,000 scholarship. Hundreds of outstanding applicants competed for this prize, administered by the Foundation for Independent Higher Education. Panels of experienced college educators chose the winners, who had to be enrolled in a private college or university, indicate an interest in working in a business environment, demon-strate high academic achievement and potential, be committed to leadership and service, and respond to a series of essay questions. In addition to receiving the scholarship, which he may renew for his senior year, Ryan is eligible to apply for a salaried summer internship with Liberty Mutual. “The study of theory and application of business and economic principles fascinates me as well as stimulates in me a desire to grasp how we make practical decisions and to solve problems that we face in our daily lives and on the international scene,” Ryan wrote in his essay for the scholarship. 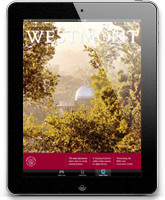 Not only does he maintain a 3.8 GPA, but Ryan co-leads the off-campus division of Westmont Student Ministries. He oversees programs that help the community such as Bread of Life, an outreach to the homeless; Adopt a Block, a door-to-door ministry that exchanges services for opportunities for prayer (he actually washed dishes for one family); and Compassion, which cares for the children of battered women. Last summer Ryan traveled to Japan, Seoul, South Korea, Moscow, St. Petersburg, and Prague with the economics and business department’s Westmont in Asia program. He graduated as the valedictorian of Chowchilla High School. 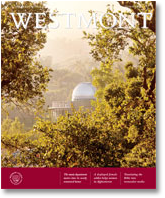 His sister Rachel ’07 also attends Westmont, and his sister Roslyn is a high school student who aspires to play sports for Westmont.